Available in bookshops nationwide. Are Friends Electric is launched at Te Auaha on Thursday 14th June from 5.30 – 7.30pm, with Helen in conversation with Maria McMillan. I know, I know: don’t judge a book by its cover. But when they’re as hauntingly beautiful as this one, it’d be remiss of me not to acknowledge it. It is tonally perfect for the poems that follow. Reading this, Helen Heath’s second collection, was easy. And I don’t mean to intimate that it’s simple, it is not. It’s more a sense that Heath has done the work so you don’t have to. She’s already cut the flesh from the bone. It’s up to you how you eat it. She has the sort of surefooted style that makes it seem effortless – which is of course a clear indication that it has not been. For something that marries science with love and grief, the work is never too cold, too clever, too clichéd, or too dark. Instead it weaves a story of questions. What does motherhood mean? Fatherhood? Personhood? What does it mean to create (a) life, and to lose it? Can we ever hope to recall what mortality claims from us? That sets a pretty strong scene. The very first poem – Reproach – was my favourite of this section. Its footnote explains that it includes text from Plato’s Phaedrus, a dialogue between Phaedrus and Socrates on the invention of writing. but your words just create forgetfulness. The second half of the book, Reprogramming the heart, begins with another scene-setting epigraph, this one from Arthur C. Clarke. Reading this half of the book I couldn’t help but to think to myself, ‘Do androids dream of electric sheep?’ not so much a conjuring of the novel as a kneejerk neural leap to those particular words and that particular question. Heath is asking her own questions. Can and should androids be created to love humans? Do we love or despise them? Is it ever possible for them to fully replace us? This sense of both philosophical and scientific enquiry is mixed with social commentary and creates a backdrop for the real impact of the poems; in the exploration of parenthood, grief and loss. spirit is in this machine. His emails, his apps, his photos. Just as I was finishing the book, Heath made a public post on Facebook. ‘I created a playlist for my book,’ she said. ‘It will be interesting to see if people make connections between the songs and poems. Some are more obvious than others! Some are just more of a mood.’ The eclectic list included Aqua’s Barbie Girl, Daft Punk, Gary Numan (of course), and Flight of The Conchords’ Robots. I was happy to be transported by Heath, even into places that made me uncomfortable (see: Uncanny Valley), or sad. And the book’s final poem, while undoubtedly sad, ends on a note of hope. Sport 45 is packed with an array of new and brilliant pieces from New Zealand writers. There’s poetry, there’s essays, there’s even a novella. It’s a collection that’s not afraid to widen its scope, and this is how it provides a wonderful snapshot of new writing. While reading through each piece of short fiction, I couldn’t help but recognise common themes. I discovered many characters who were estranged, isolated, alone. I saw the loneliness of waiting, as reflected in Tracey Slaughter’s story ‘Cicada Motel’. I stumbled through the bush with Kerwin in John Summers’ short story ‘Own Shadow’, as he tried to understand what was haunting him. But the dynamic between characters also spoke volumes. Displaced in new and unfamiliar places, characters were left to try and make sense of each other. In Melissa Day Reid’s short story ‘I Will Come and Find You’, a husband and wife have travelled to Barcelona on a whim. They have also decided to abandon planning for spontaneity instead. Reid portrays Barcelona in a wonderful dream-like way; she describes a snapshot image of ‘arm, neck, lips, ear, tears, drums, and firecrackers’. But shifts in dialogue reveal a growing rift between this husband and wife. In fact, the two seem to be talking on top of each other. The wife points out a candlelit room in a building; her husband sees an alleyway below it and starts making his way there instead. As the story progresses, this rift widens. The piece seems to capture the natural but inevitable drift that sometimes takes place in friendships and relationships. It’s a palpable and bittersweet emptiness. And in this story, Reid explores whether this rift can be stitched up again. Nicole Phillipson’s novella, ‘Moulin d’Ornes’ touches upon these estranged themes as well. Paul travels to a commune in France, intending to get away from the world so he can write. It’s a quiet setting where ‘the old, grand beauty of Europe… made his memories of New Zealand seem slightly cheap.’ In her novella, Phillipson highlights an interesting advantage to moving away: the delight of cutting away old connections. A few essays also slipped in next to these pieces of fiction, taking their place comfortably amongst other genres. Giovanni Tiso’s essay ‘Before the Earthquake’ is one of these essays. Tiso describes the possible calamities that could occur if a serious earthquake were to hit Wellington. But he also describes the emotional state that Wellington is already living in because of this possible earthquake. Wellington’s next serious earthquake is not an if, but a when. As Tiso states, ‘we live before the earthquake. Everything around us is foreshadowing’. There is also an array of beautiful poems in Sport 45. Helen Heath’s poem ‘A Rise of Starlings’ is delightful; she beautifully weaves the image of ‘wild celestial fields’ and messages traced ‘in particles of dust and light’. Natalie Morrison’s poem ‘Three edible grandmothers’ is a peculiar and whimsical little piece that sounds like it came from a fairy tale. Overall, Sport 45 is a delightful instalment of this annual magazine, and there are a variety of pieces that provoke wonder and rumination. Helen Heath chaired a panel discussion on how collaborative technology can encourage radical cultural change in business, with Loomio co-founder Richard Bartlett and REA Group CIO Nigel Dalton. He related how reading Zen and the Art of Motorcycle Maintenance had profoundly affected him. Bartlett described at length how Occupy Wellington had really made him check his privilege, and then proceeded to explain social justice. He said several times that “if you’re not explicitly challenging structural oppression you end up perpetuating it”. During the Q & A section at the end an audience member asked Bartlett, not unreasonably, how his product Loomio (a digital decision-making tool) challenges oppressive power structures. He said that people are less aggressive on the internet (?) and that “software can passively and automatically change power dynamics”. It’s an intriguing concept, but unfortunately by that point we’d run out of time to learn more. I am continually fascinated by the ways in which the internet changes the way we read. Dalton commented “every digital Kindle book makes a real book more precious”, and I would have liked to have heard more discussion on that point. He also said that the difference between the internet and a book is that with a book you have to finish your idea. Bartlett said that the problem was that “publishers haven’t gone through the grieving process [like we did in Occupy Wellington] and they’ve been bought up by Rupert Murdoch, centralising power instead of distributing it”. Since the session today, Bartlett has written a blog post entitled “The speech I wrote about patriarchy but didn’t have the courage to deliver on stage today” about all the things he wishes he could have said to us. He ends: “patriarchy and capitalism and colonialism [have] turned me into the self-centered loud-mouthed know-it-all that keeps trying to grab the microphone.” Maybe he just needs to get more agile. This book is in bookstores now. 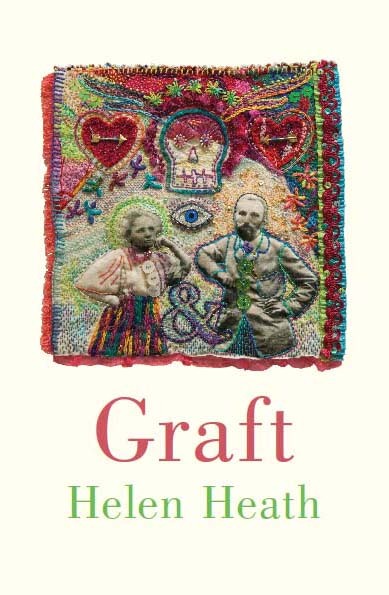 This last week I’ve been reading Helen Heath’s new collection of poetry, Graft, from Victoria University Press. Like the cover of the book, the poems in this collection are all stitched together in beautiful and unexpected ways. The poems shift between science, fairy tale, and the domestic, but they never end up in the places you were expecting. The fairy tales sound like fact, and the fact sounds like fairy tale, whether it’s two children following white Lego bricks by moonlight or Marie Curie with her blue vials of radium. The world fairy-tale makes the whole thing sound a bit twee, but what I liked about this collection was that it was able to make leaps between myth and fact without being cute, or doing that other thing that people sometimes do when rewriting fairy tales and turning them into a kind of gothic soap-opera where everyone’s either wandering around in the forest in a torn negligee, or dancing themselves to death on hot coals. These poems are full of unexpected shifts and uncertainty, and I like poems that aren’t afraid to be uncertain. The poems all manage to avoid that kind of ‘epiphany moment’ and often end up in an unexpected place. I’m not talking ‘he was actually a ghost all along’ kind of unexpected place (hey Bruce Willis, what’s up) but after reading these poems, I feel like my brain has been flipped around a couple of times, in the best possible way.